Well, these came about because I couldn’t bear to throw or recycle such pretty old jars as much as anything else. I may not have been keen on the relish they contained but my husband made short work of that and I got to keep the jars for myself! The holder is something I had been keeping for quite a while (something else I couldn’t bring myself to get rid of!) but they look equally as good as single jars. They are simplicity itself to assemble and great fun to do. The only thing I would suggest is that you consider what you are going to fill them with first. I filled one with 100 cute-but-tiny buttons – they don’t look like that many once they are in the jar so I was glad I hadn’t used a large jar to begin with! A few metres of ribbon, lace, etc. would fill a larger jar more easily. I cut a circle for each jar which measures twice the size of the lid. Filled the jars. 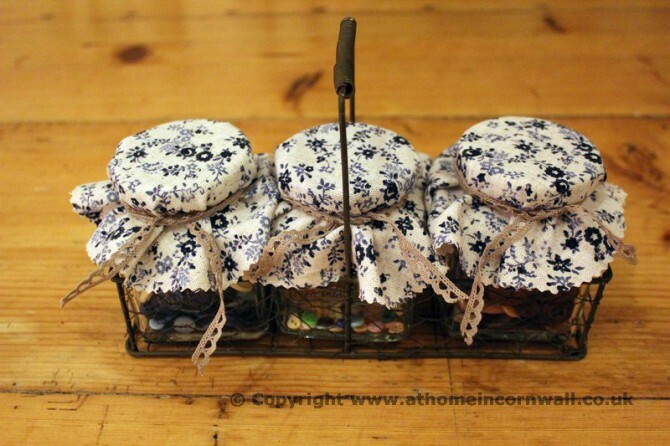 Placed one piece of fabric on top of each jar lid, using the elastic band to keep the fabric in place. I tied my lace/ribbon around the neck, finishing with a simple bow/knot. Place jars in the holder and gasp at how such a quick and easy project can give such great results! These are great for using a special piece of fabric because you need such a small amount. Using a piece of your Granny’s fabric or something from a piece of old clothing, you can get a great shabby/vintage look from just a few of the jars.